Elijah Thomas couldn’t stop smiling towards the end of Clemson’s latest contest against Georgia Tech. The big man inside had just collected one of his five blocks and ran the floor. He gave the ball up to point guard Shelton Mitchell in hopes of getting the ball right back for an alley-oop. Instead, Thomas caught an errant pass and flipped the ball right to David Skara for an easy layup only to increase Clemson’s huge lead. Everything just about went Clemson’s way during its comfortable 65-42 win over the Yellow Jackets in Atlanta. 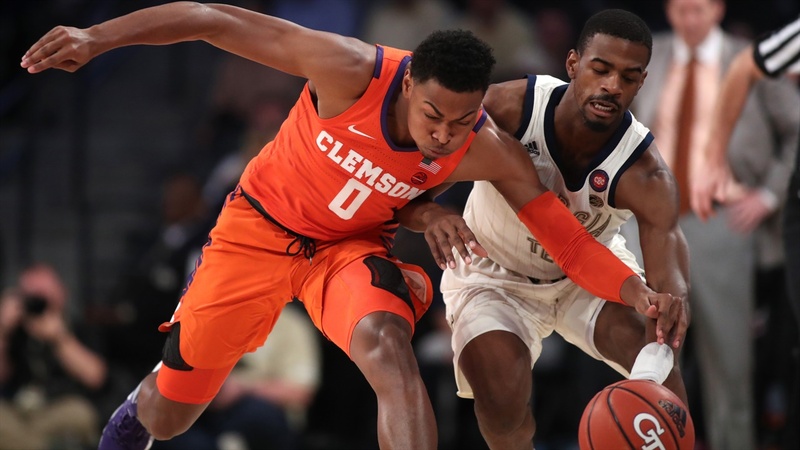 The Tigers managed to get their first road win in ACC play in a similar fashion to how they won their previous game: suffocating defense. Clemson (13-8, 4-5) limited Georgia Tech to 13-of-45 (28.9-percent) shooting from the floor, and four of those made baskets were three-pointers. The Tigers also forced 17 turnovers, which led to multiple transition buckets. It started as Clemson went on a 24-6 run in the first half to take a commanding lead after facing an early deficit. At one point, the Yellow Jackets had only made one of their previous 11 shot attempts. Georgia Tech was able to overcome the deficit and make the game single-digits before halftime, trailing 24-33 at the break, but Clemson’s defense stood tall. Shelton Mitchell, who poured in eight points and collected five boards, could have directed Clemson’s offense to go to Waffle House if he wanted to and it still wouldn’t have mattered. For the first time since 2013, Georgia Tech (11-12, 3-7) has failed to score at least 50 points in consecutive games. The 80 points allowed in Clemson’s last two games are the fewest points given up in back-to-back games in program history since the ACC began. The Tigers outscored the Yellow Jackets 32-18 in the second half as Marcquise Reed, who scored a career-high 30 points the last time these two teams met, found his groove. The guard finished with a game-high 19 points on 9-of-16 shooting. David Skara and Aamir Simms finished with 13 points apiece and showed how pivotal they are on both ends of the court. “When David ad Aamir play well offensively, that's when things get to a different level,” Brownell said. Clemson shot 48.2-percent from the field and outrebounded the Yellow Jackets 42-26 to grind the game away. All of a sudden, Clemson has strung together three consecutive victories in the ACC. All three of those wins have come by double-digits, which is the first time Clemson has beaten three straight ACC foes by double digits since 1974-75. Even though Clemson started off league play slow with a 1-5 start that was topped off by a gut-wrenching loss, it’s not surprising that Clemson’s veteran-led team has been able to string along some victories and not let the start affect them. “We know it’s a tough road here down the stretch. We’ve got nine hard games left. We’re thankful that we’ve been able to right the ship and play better,” Brownell added. “We talked about when we were 1-5 that we weren’t going to worry about where we are in the league, what it means, this that and the other. Can Clemson get back-to-back-to-back good days? The Tigers look to keep their momentum going in the right direction with a significant home game against No. 11 Virginia Tech at noon on Saturday.